In this short clip, Chunky Mark, the artist taxi driver, expresses his absolute disgust at a report that Toby Young, the grotty right-wing hack Theresa May put on the regulatory board for the universities, attended a secret eugenics conference recently at University College London. What, he asks pointedly, does this say about the Tory party? He points out that Theresa May, Boris Johnson, Jo Johnson, Fraser Nelson and Andrew Neil all defended Young, despite knowing about his foul and dangerous views on this subject. Up to this video, I was prepared to give Young the benefit of the doubt on eugenics. Yes, he’s an obnoxious, right-wing snob, who’s published pieces sneering at the working class, disabled people and a variety of left-wing issues and causes. This includes the Welsh. I can remember him appearing on one of the TV shows a few years ago describing how he had to sneak out the back way when he appeared on Welsh radio in Cardiff. Young had previously described the Welsh as ‘swarthy, stunted trolls’ or something similar, and one of the station’s listeners had decided that he wasn’t going to put up with it, and had come in to sort the wretched hack out. So Young was forced to scurry down the back stairs to avoid him and a good hiding. I knew from the various articles on Young, including those put up by Mike over at Vox Political, that he had published a piece arguing for eugenics. This is the pseudoscientific doctrine that some people are biologically unfit, and to maintain the purity and fitness of the race should be prevented from breeding. It was a part of Nazi policy during the Third Reich, when recidivist criminals and the congenitally disabled were sterilised, in order to prevent them passing on their bad biological heritage. It was also the rationale behind the murder of the disabled under Aktion T4, in which the mentally handicapped were taken to special hospitals and gassed by Nazi doctors under the direction of the SS. The Nazis based much of their eugenics legislation on contemporary laws governing biological heredity and disability in America, which provided for the forcible sterilisation of those considered ‘unfit’. Indeed, the Nazis boasted that in this regard, they had not invented anything. Similar views were held by a number of people over this side of the Pond, where eugenics was, in the early part of the 20th century, one of the popular topics among the chattering classes. The Nazis’ crimes against humanity and their mass sterilisation and murder of the disabled, as well as their attempted genocide of Jews, Gypsies, Slavs and other ethnic groups they considered subhuman, were no doubt powerful influences that turned popular and elite opinion against eugenics. Nevertheless, the subject continued to survive amongst a group of supporters. The ‘societies and clubs’ section of Whitaker’s Almanac for 1987 includes the Francis Galton Society, named after Darwin’s cousin, who first promoted the idea, and which existed to promote eugenics. I’d assumed, however, that when he published the article, Young may not have been entirely serious. Young strikes me as little more than a troll, adopting deliberately offensive views and language, in order to upset people. Sort of like Milo Yiannopolis, but heterosexual and without the Jewish heritage. I did wonder if he was one of those Tories, who admire Auberon Waugh, who used to publish similar articles in Private Eye and then the Torygraph sneering at the left, in what was seen by his admirers as some kind of wit. In fact, precious little of what Waugh seemed to me to be at all witty. It mostly seemed to be just abuse. I particularly remember his sneers at teachers in the Torygraph, which in retrospect just followed the Tory line of blaming teachers for everything wrong with British education while screaming loudly about progressive education, left-wing indoctrination and the need to bring back grammar schools. He also appeared on Wogan’s chat show, where he also spewed hate at the Greenham Common female peace protesters, decrying them as ‘lesbians’. Which wasn’t even the most original insult, as just about everyone on the right was claiming they were. Some may well have been, but certainly not all. Especially as some of the early news reports described how many of the women had children, whom they were missing terribly, and so presumably also male partners. I’d assumed Young had adopted eugenics as just another extreme, right-wing pose in order to cause the upset and anger that he appears to thrive on. But it’s clearly not the case. If he attended this conference, then he really does believe it. Which makes him a positive danger. From the article as it appears in the video, it seems that the report comes from Private Eye, and Chunky Mark states that he can’t even read about some of the things that went on at the conference. But Young was there, along with Nazis and other horrors. As for what it says about the Tory party and its leadership, there always has been a current of extreme right-wing attitudes and policies within the Tory party, and it’s certainly been no barrier to advancement in the Tory ranks. Way back in the 1970s Thatcher’s mentor, Keith Joseph, caused outrage when he declared that unmarried mothers were a threat to ‘our stock’, using the language and attitudes of eugenics. And there has been a fringe of the Tory party that admires and has had links with the Fascist right. Way back in the 1980s one of the Libertarian groups within the Tory party held an annual dinner at which the guest of honour was the head of one of the death squads then exterminating left-wingers in Central America. One of the members of that group, if I recall correctly, was Paul Staines, the founder of the Guido Fawkes blog. Young has since resigned from his position on the universities’ board, despite being loudly supported by Theresa May. His appointment was, in any case, a calculated insult to students. Young was put in because he favours the privatisation of education, as shown by his promotion of free schools. As for his other, obnoxious views, I’ve no doubt that they appeal to the type of grassroots Tory, including those on the backbenches, who regularly cause a scandal by blaming crime on Blacks and immigration, and rant on about how wonderful Enoch Powell was. At a time when students are worried about paying off tens of thousands in debts and tuition fees, Young and his grotesque opinions were a calculated insult. They showed the Tory faithful the absolute contempt the party really had for these pesky students and their concerns over the quality of the education they were receiving, and the determination of May’s government to continue privatising education and stamping out any trace of perceived left-wing bias, regardless of the wishes of students, lecturers and educationalists themselves. All done so that universities, like schools, would indoctrinate students with the required Tory view of history and politics, as demanded by Michael Gove, amongst others. Young’s appointment was met with a barrage of complaints and opposition, leading to his resignation. It’s significant that he was not replaced by Theresa May, despite considerable pressure to do so. Some of this may have been weakness on her part. Young was supported by Gove and Johnson, and she may have been afraid that if she sacked Young, those two would move against her, just as they intrigued against Cameron. But it also shows that May, and the rest of the Tory front bench, really don’t see anything wrong with Young’s opinions, even when they include such an inflammatory, dangerous ideology as eugenics. Chunky Mark ends his video by stating that they should all resign. He’s quite right. This is a brutal, murderous government anyway. It’s policies of stripping away workers rights, enforcing low pay, and zero hours contracts, have forced millions in work into poverty. At the same time, their expansion of the sanctions system have resulted in nearly a quarter of a million people relying on food banks for their next meal, and has led to the deaths of almost a thousand or so disabled people, deprived of benefits after being declared ‘fit for work’. Left-wing commenters like Mike, and the commenters on his and my blogs have called the deaths ‘the genocide of the disabled’, and suggested that it does indeed come from a conscious eugenics policy by the Tories, targeting the disabled for death. But done quietly, so as not to alarm the general public. After reading about Young’s very real support for eugenics, you could be forgiven for wondering if this isn’t, after all, the literal truth. The Tories are a danger to the working people of Britain, and particularly to the poor and disabled. They should be removed as quickly as possible, and never let back into power. 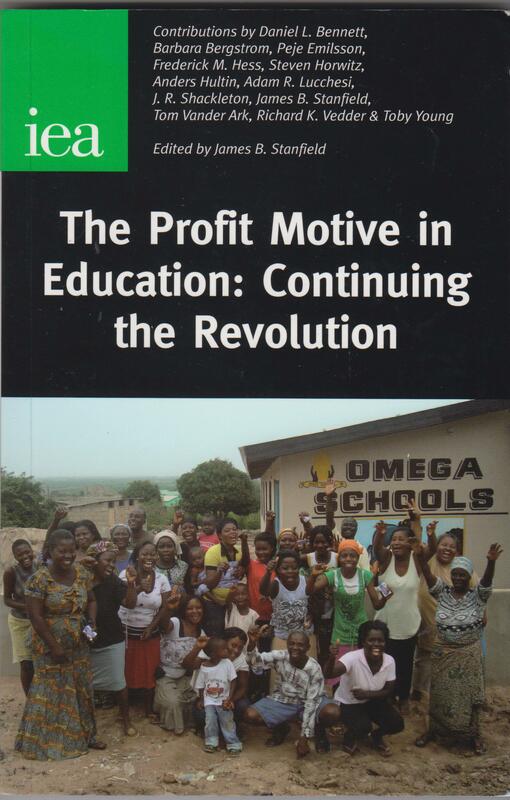 The Profit Motive in Education: Continuing the Revolution, James B. Stanfield, ed. (London: The Institute of Economic Affairs 2012). The UK government – in common with the governments of many Western countries – is in the midst of implementing policies to reform education. However, the government has, as a matter of principle, decided that profit-making schools cannot provide state-funded education even if they would lead to substantial improvements in quality. This monograph makes the case for widespread acceptance of the profit motive in education. It does so not by presenting statistics that demonstrate that profit-making organisations could drive up quality – there is already a substantial literature on this. Instead, the authors show how profit-making organisations could create an entirely new dynamic of entrepreneurship and innovation. As well as improving quality and reducing costs within existing models, such an approach could lead to the development of completely new ways of providing education. The authors of this monograph have a range of international experience. Many of them have run profit-making schools in countries more accepting of the profit motive than the UK, such as Sweden. Others have struggled against the odds to participate in education reform programmes in the UK. Overall, this collection makes and important contribution to the international debate about education reform. Basically, this is a book to encourage the privatisation of the education system, as shown in the contents and various chapters. Chapter 1, the introduction, by James B. Stanfield, has the section, ‘Questioning the Anti-Profit Mentality’; 2, by Steven Horvitz, is entitled ‘Profit is about learning, not just motivation’; Toby Young’s chapter, 3, is about ‘Setting up a free school’, and so on, from contributors in America and Sweden. The final chapter, by Tom Vander Ark, is entitled ‘Private capital, for-profit enterprises and public education’. This has individual sections on ‘New openings for private capital’, ‘The for-profit advantage’, and ‘Combining philanthropy and profit-seeking investment’. This is by and for the people, who want to privatise our schools and charge us all money for sending our children there. One of the chapters speaks glowing about the voucher scheme, to allow parents to opt-out of state education, and spend the money that would have been spent by the state on private education for their sprogs instead. He has also served up more article taking down Toby Young, one of the more visible and offensive of the Tories, who keep on turning up in the media. Mike over at Vox Political has also put up very many articles, showing that free schools and privately run academies perform worse than schools run by the LEA. One of the chapters in this book is on budget fee-paying schools in the US. They would have to be. A friend of mine told me that in the heyday of British private education just before the War, but private schools were on very tight budgets just a few steps away from bankruptcy. If they took on more than a handful of non-fee paying pupils, they’d go under. Or is this just Eton’s excuse for only taking one, non-paying pupil, in order to qualify as a charity and so get public money? The book’s only value is as a guide to the people, who want to privatise the British educational system, and why they believe in it. And the Institute of Economic Affairs unfortunately not only influences the Tory right, but also the nominal Left. I’ve got a feeling the Blairites were in contact with them and had them as their advisors. This is the ideology and the people behind it, who want to sell of Britain’s schools. And if we really do value education in this country, for the benefits it brings in itself, and not as income stream for public-schooled self-styled entrepreneurs – they have to be stopped. Mike over at Vox Political has put up a piece on a report in today’s Guardian, showing that schools run by local authorities perform better than academies and free schools. The study by the Local Government Association found that 86% of state-run schools were classed as ‘good’ or ‘outstanding’ by Ofsted, compared with 82% of academies and 79% of free schools. Furthermore, local government-run schools were better at improving. 98% of local government schools had done so by the time of their first Ofsted inspection, after being rate ‘inadequate’. The figure for academies was ten per cent lower 88 per cent. The same article in the Guardian reported that Thicky Nicky would not be drawn on questions about negotiations with Tory councils to allow them to run some of the academies, in order to avoid a backbench revolt. Mike makes the point that this shows that the Tories’ desire to privatise the education system is driven by ideology, not fact, and that Thicky Nicky is flagrantly incompetent. He has recommended that she be returned to the back benches. I agree that Thicky Nicky should go back to where she came from, but ultimately, she isn’t to blame. 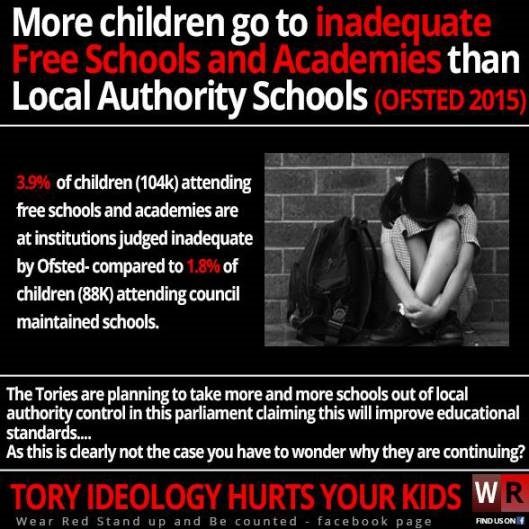 The rot started long, long before, when Maggie Thatcher started ball rolling about taking schools out of local government control. It was then picked up by Tony Blair, who launched the academy system. Now it’s being massively extended by David Cameron, who, as a public-school toff, probably believes that privatising these schools will magically turn them into the prole equivalent of Eton, Harrow and the rest. I’m not exaggerating. Years ago Private Eye reviewed Danny Danziger’s Eton Voices, which quoted one old Etonian as saying that schools would improve if their pupils were given the same confidence that Eton gives its pupils. The Eye’s reviewer attacked the vacuity of this statement by sarcastically stating that it was so profound, it was worthy of the SDP in its prime. This to my mind seems a bit harsh on the SDP. What the study does is disprove thirty years of Thatcherite propaganda: that private management is always superior to that of the state, and that the privatisation of a concern or enterprise will automatically solve its problems as if by some weird economic magic. It clearly doesn’t. But this won’t stop Cameron and the rest of them, who are ideologically wedded to the idea. They also have a powerful vested interest themselves in education’s privatisation. They’re the children of the haute bourgeoisie, and have a class interest in extending private ownership. They are also funded very handsomely by big business, and often have personal links to the companies lining up to buy up the remains of the state sector, and so have personal reasons for wanting education privatised. After all, we wouldn’t want to disappoint Rupert Murdoch and his aspirations to run an education chain. Thicky Nicky’s role in all this is actually quite minor. She’s just the latest face shoved in front of the public to sell the policy. She replaced Michael Gove, who was also less than competent, and will probably be replaced by someone else in the next cabinet reshuffle. The ultimate responsibility is David Cameron’s. He’s the one who really should be overthrown, and have to trudge back to the back benches. Mike over at Vox Political ran this story from the Groan, which reported the kind and courteous welcome Nick Gibb got when he spoke to the Association of Teachers and Lecturers at their conference in Liverpool. Of course, I’m being ironic when I say that it was ‘kind and courteous’. In fact that they jeered him. And I don’t blame them. What Gibb said was pure rubbish. The Tories are, of course, determined to turn 17,000 primary schools in England into academies. Gibb made the usual attempt to try to justify this massive privatisation to the Tory party’s corporate backers by saying that it would lead to an improvement in quality. He told his audience of educational professionals that if they spoke to the headmasters, who had become heads of the academy chains, they would hear that academy schools were flourishing. Because they’re professionally led. This is, of course, complete twaddle. The same could also be said of the state schools under LEA control. They’re also managed by professionals, in the sense that the Local Education Authority is staffed by people, who earn their living from managing schools. Just as the actual teaching and administrative staff in the schools themselves, the teachers, teaching assistants, school secretaries, dinner ladies and caretakers are also educational professionals. After all, the work in education. Mike has already pointed out, along with very many other bloggers, time and again, that standards in academies and free schools are actually worse than state schools. 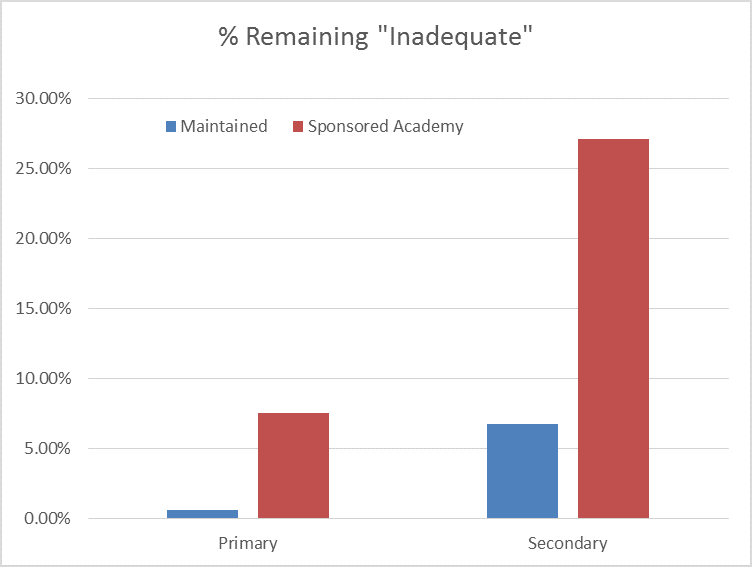 In the comments to the article, he reproduces the following graphic, which shows how the number of academies which are rated ‘inadequate’ far outstrip LEA schools. In fact, 25 academies last year had to be handed back to state administration because their standards were so bad. Charlie Stayt made a valiant attempt to get Thicky Nicky Morgan to admit this, but the minister with the mad staring eyes just carried on chuntering about how terrible it was that schools were being left under the control of local authorities, which continued to inflict their low educational standards on their impressionable young charges. The opposite is true. Of course, the government likes the idea of privatising, are part-privatising the education system, because it hands over a very lucrative state enterprise to their corporate backers. They, and their big business paymasters also like it, because it means that private industry can set the terms of pay and conditions much lower than in the state sector. For example, it was the case that to teach in a state school, you should have a teaching qualification. You either did a teaching degree, or you completed a normal degree, and then took a PGCE. I don’t know if the situation’s changed now, but a few years ago you didn’t need a teaching qualification to teach in a private school. This is, I should repeat, private schools rather than academies. But my point remains. Pay and conditions for the teaching staff are lower, and the staff themselves may not be as well qualified as their counterparts in the state sector. So where does the money spent on academy schools actually go? The obvious answer is the pockets of the senior managers and shareholders, who are obviously looking forward to doing very well out of it, thank you very much. And this also gives the lie to the claim that private enterprise is somehow more efficient and less bureaucratic. Clearly it isn’t, as there’s a whole bureaucracy in the academy chains themselves, as well as the extra expense of giving lucrative dividends to the shareholders. No doubt as the teaching unions continue to voice their opposition to the privatisation of England’s schools, the Tories will start to bang their usually drum about how ‘loony-lefty’ teachers are threatening their pupils’ future with their doctrinaire opposition to the government’s wonderful new policy. And here again, the truth is the precise opposite. Teachers teach because they enjoy imparting knowledge. Not always successfully, and very often not to receptive pupils. But they do it because they find it rewarding. And, in general, they are very concerned to make sure that their pupils perform to the best of their ability, and get the best available opportunities for their education. It was the teaching unions in the 1930s who kept up the pressure for compulsory state secondary education. But you are very definitely not going to hear that from the likes of Nick Gibb or Thicky Nicky Morgan. Forget the government’s hype. The conversion of the primary schools into academies in England will lead to worse standards. It’s the teachers opposing the government’s reforms, who are really trying to maintain and improve them. Mike’s article is at: http://voxpoliticalonline.com/2016/04/04/teachers-heckle-schools-minister-over-academy-plans/#comments. Go and see what he says. Another very interesting piece from Mike over at Vox Political. Nicky Morgan, Cameron’s education secretary, has announced that the government is launching the next phase of its education reforms. They are going to send teachers into failing schools to raise their standards. This includes schools in ‘coastal areas’. Now schools on the coast don’t exactly strike you as the quintessential example of a struggling school. You’re more likely to think of one in the inner cities, especially those areas with high unemployment, crime and drug rates, and where many of the pupils are the children of immigrants, who speak English as a second language. On the other hand, I have heard some real horror stories about some of the more deprived communities on the British coast, even in the relatively affluent south, which seem more like something from Royston Vesey from the League of Gentlemen. Morgan would like us all to believe that failing schools are all state controlled, but the reality is that most failing schools are free schools or academies. See the piccie below. Mike’s story’s at http://voxpoliticalonline.com/2015/11/03/thicky-nicky-elite-teachers-plan-should-be-for-the-disaster-that-is-free-schools/ Go there for further grim details. There was a very interesting moment when Thicky Nicky was being interviewed on BBC breakfast television by Jonathan Stayt (if I’ve got his name right). She was giving a spiel about how the Tories were determined to raise standards in education by allowing more schools to opt out of the state sector. Stayt then asked her how many schools had been taken back into state control after failing miserably as free schools. He kept asking, and didn’t receive a reply, and eventually gave up with the words, ‘You know how many’. It was 25. At least. Thicky Nicky’s stupid, but not so stupid as to give the game away, and talk herself out of a job. This isn’t about raising standards, but about privatising education by the back door. And one of those hoping to get his corporate foot in is that famous Australian intellectual and educationalist, Rupert Murdoch. At least when the Monster Raving Loony Party declared that if they got into government, they’d make Oliver Reed minister for culture, you knew it was a joke. Unfortunately, the Tories and the Dirty Digger are serious. And everyone else’s education is going to suffer as a consequence.